When we think of Lent, we think of spring. That's because the word comes from a German word for "springtime". In many other languages(e.g. Spanish: Cuaresma), the name for the season before Easter is derived from the Latin word for "40", a clue that something else important is happening, something that our Scripture talks about. The 40 days of Lent recall the 40 days of Jesus' being tempted in the wilderness. But when we look at the Gospel accounts of Jesus' temptations, always read on the first Sunday of Lent, we see that they in turn direct us further. Jesus' temptations recall the 40 years of Israel's temptation in the wilderness on their journey to the Promised Land. The number 40 is a very familiar one in the Bible. In the story of Noah and the flood, it rains 40 days and 40 nights. After the sealing of the covenant at Mt. Sinai, Moses is with God on the mountain for 40 days and 40 nights. When the prophet Elijah is being pursued by Queen Jezebel, he flees for his life and travels for 40 days and 40 nights until he comes to the mountain of God at Horeb. The number appears also in the New Testament. Jesus is tempted in the desert for 40 days and 40 nights and his ascension to heaven occurs 40 days after the Resurrection. In the passage at the start of this section, the Israelites are encamped in the southern desert, within easy reach of the Promised Land. Scouts go ahead to survey the land, which they do for 40 days. They bring a glowing report of the land, but also note that some of the inhabitants are large and imposing. Despite the urgings of Joshua and Caleb, the people are afraid to go up into the land. Their refusal is a serious failure of faith in Yahweh's promise to give them the land. As a punishment, the people are to wander for 40 years, one year for each day the scouts were gone. Numbers in the bible are often not meant to be taken literally, but serve a symbolic function. Our suspicions are aroused especially with a number that recurs so frequently as 40. 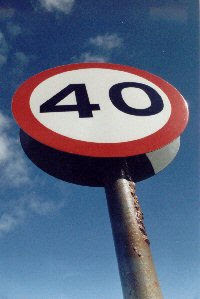 What would be the symbolic meaning of the number 40? On one level, it represents a longer period of time, but there is more. The longer time has content: It is a time of need, of struggle, of testing. There is in fact extra-biblical evidence for this usage as well. But in the Bible, a third level of meaning appears. 40 denotes a period of preparation for some special action of the Lord; it is a time of grace. After the flood in Genesis, a new creation begins. After Moses converses with God, the covenant is renewed. After Israel's wandering in the wilderness, they will enter into the Promised Land. After Elijah's journey, God strengthens him to resume his prophetic ministry. After Jesus' temptation, he begins his public ministry; after the Ascension, we enter the age of the Church. At the end of the season of Lent, we celebrate Holy Week and the great feast of Easter. From the very beginning of Lent, God's word calls us to conversion. If we open our ears and hearts to that word, we will be like the Ninevites not only in their sinfulness but also in their conversion to the Lord. That, simply put, is the point of Ash Wednesday!